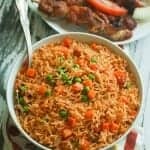 Jollof Rice (Oven Baked) – Easy, flavorful and perfectly cooked Jollof rice made completely in the in the oven, 5 min prep – no blending or stirring involve. What more could you wish for? Simply put, the easiest rice you would ever make. 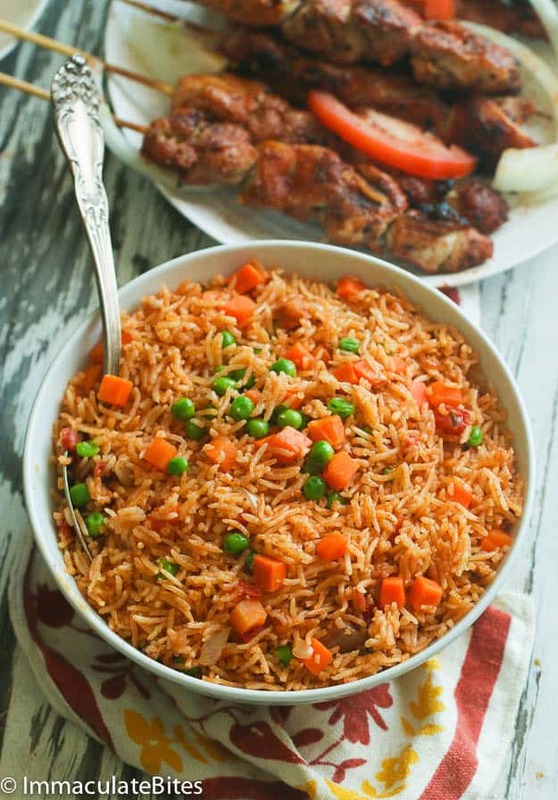 Jollof rice is a legendary one-pot dish that’s ubiquitous in Nigeria, Cameroon, Ghana, Liberia, Togo, and Sierra Leone. 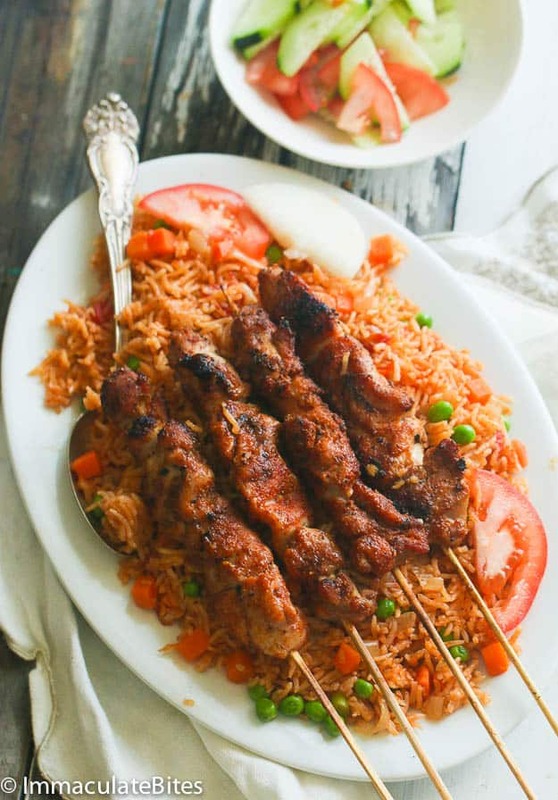 In fact, this is the most popular party food in West Africa and has been gaining momentum elsewhere in East Africa. Because of its popularity there has been several debates as to its origin. What I know for sure is that- it is an AMAZING one-pot dish and there is no argument when everyone is shoving it down their throat. 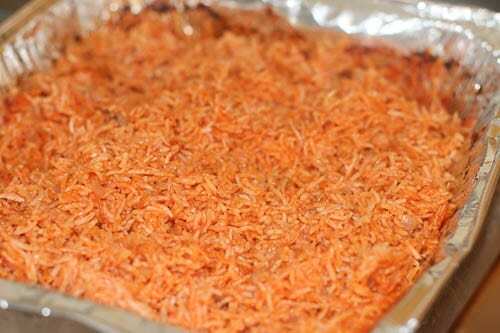 I just want to say that jollof rice is great for entertaining, especially if you have picky kids. They always go for it. It is fair to say , this delicious rice dish is a fairly easy to make anywhere in the world because the ingredients are easy to find. However, there is a lot of stirring involve and sometimes the rice would stick to the pot making the dish quite UN appetizing. Here, I completely eliminated the problem by making it in the oven. Here is how you do it. Measure all the ingredients throw them in a ½ baking sheet pan. Cover; cook for about a 60 minutes. 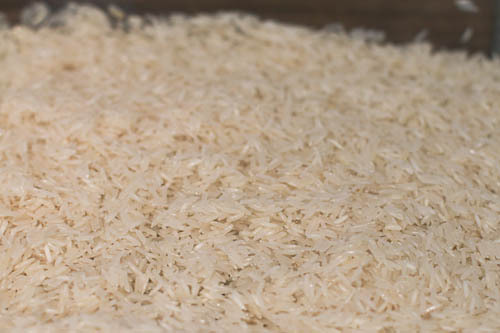 Let it rest remove cover and voila-Perfectly cooked rice. Now, if you are not vegan and want to throw in some meat or protein do so by all means. Stir fry shrimp, beef or chicken and medley of vegetables, mix and serve. You have your self a great meal that the whole family would enjoy. I have tried several cookware for this rice and my recommendation are as follows. Any shallow baking dish would work here , a dutch oven is good too and an Aluminum baking dish. 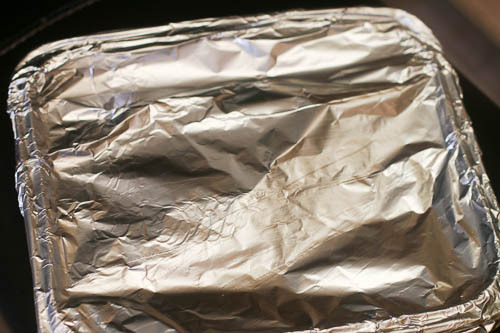 Tightly cover the pot or pan , with foil paper or it’s lid . if you can double foil paper. 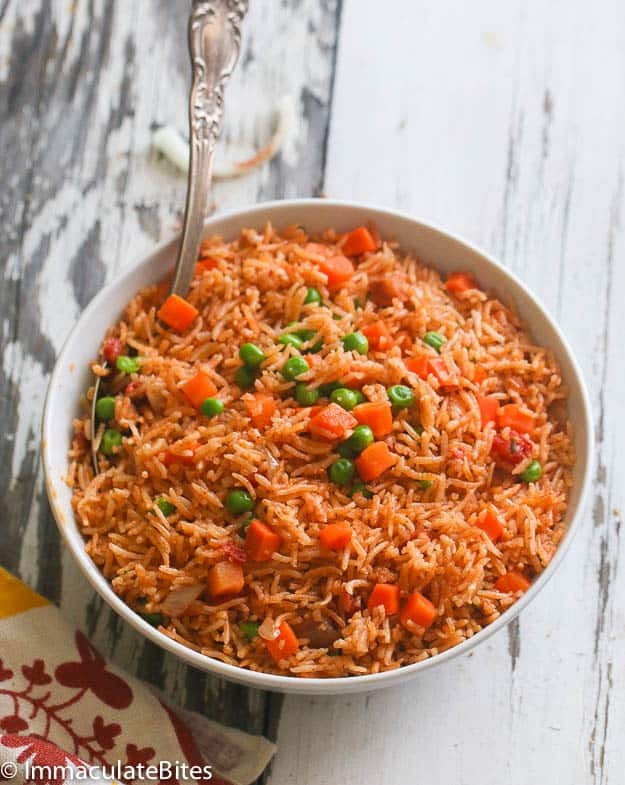 Easy, flavorful and perfectly cooked Jollof rice made completely in the in the oven, 5 min prep – no blending or stirring involve. Gently place in oven and let it cook for about 70 -80 minutes . Carefully remove remove from the oven and check after 70 minutes. 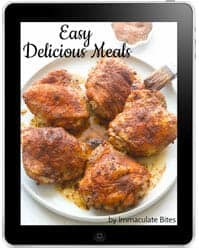 Since posting I have retried recipes several times and it works best for my oven after 75 minutes. I tweaked it a little bit. Instead of using broth I blended red peppers without water and added it. It came out really yummy. Is the rice pre cooked? I love your method of making it in the oven. My only issue I had is all of the seasoning was left on top, with cooked rice on the bottom. I mixed added a tiny bit of water and hopefully that will do it. Thanks again! Hi! 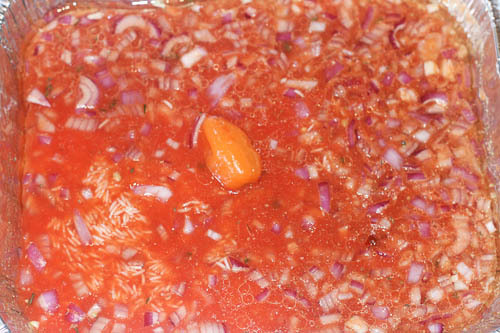 Red onions or white onions in this style of cooking. Im also making gizdodo which calls for onions. Thank you. What type of beef will I is for the Jalloff Rice? Ever try making this with a slow cooker…? Could you please explain the cube of chicken boullion – how much water should you use to dissolve it? And what kind of hot pepper should I use instead of the 1 Scotch Bonnet Pepper ? When we were visiting friends in Nigeria, they made us something that they called “stew” and served it with jollof rice. It was a thick tomato sauce and the served it over chicken (or maybe cooked the chicken in it, I am not sure which). (They also said they can do it with beef.) Does this sound familiar to you? If so, do you have a recipe for “stew” that you can suggest? Thanks! You can check out this recipe here >>> https://www.africanbites.com/beef-stewafrican-style/ Hope it’s what you’re referring, too. Enjoy! How would this work if I substitute the rice for riced cauliflower? Sorry, I can’t give you an exact proximation, I haven’t tried this with riced cauliflower. At what point do I add the shrimp to the jollof rice? You saute it separately and add after you remove from the oven or when serving it. I am not too crazy about bouillon cubes. What can I add instead?
. About 1-2 teaspoons of creole seasoning would add more flavor to it. hi! can this be made in a microwave oven instead? can’t wait to try it! Haven’t tried it in a microwave . If you do let me know the outcome . To reduce the mushy rice – reduce the liquid by 1/3 cup especially if using larger chicken thighs they tend to release extra liquid.